Documentary filmmaker R. Scott Cooper moves his family from Los Angeles to Athens, Georgia, after being hired to make a film about the dwindling influence of Christianity in America. Upon arrival, he learns that his producer, Ballard, intends to make a cheap hit-piece rather than an objective documentary. Scott turns the job down to protect his journalistic integrity, but financial difficulties force him to negotiate with Ballard who deceives Scott into believing that he will, in fact, tell an honest story. In order to dive deeper than a public worship service will allow, Scott and his wife Mary join a small group at a local church, finding a group of imperfect people doing their best to live for Christ. 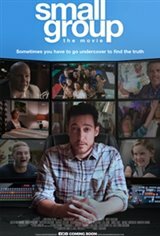 As the Coopers' relationship with their group grows, Ballard isn't pleased with the direction of the documentary and exposes their infiltration. Now we're left to see how the small group will react to such an intense betrayal.